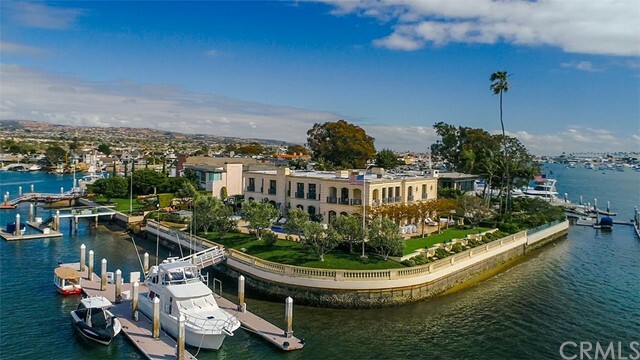 A landmark promontory location defining the spirit of the Newport Harbor â€“ 18 Harbor Island. Here classic architectural structure meets a forward-thinking design aesthetic, creating a one-of-a-kind waterfront treasure with over 300 feet of bay frontage. With clean lines, open space and purity of form the re-mastered residence with a total building size of approximately 16,000 square feet lives graciously with large-scale rooms and a panorama of sublime water views. Beautifully and tastefully appointed tA landmark promontory location defining the spirit of the Newport Harbor â€“ 18 Harbor Island. Here classic architectural structure meets a forward-thinking design aesthetic, creating a one-of-a-kind waterfront treasure with over 300 feet of bay frontage. With clean lines, open space and purity of form the re-mastered residence with a total building size of approximately 16,000 square feet lives graciously with large-scale rooms and a panorama of sublime water views. Beautifully and tastefully appointed the exquisite finishes and custom refinements are flawlessly employed. Abundant natural light cascades throughout the formal and informal spaces, illuminating the myriad bespoke details of this transformed neoclassic home. The grand-scale of the interior balances seamlessly with multiple exterior limestone terraces, flowing gardens, and a magnificent pool surrounded by the glistening waterfront and captivating, lively views of the harbor turning basin. A newly reconstructed yacht accommodation for a craft in excess of 120 feet, as well as additional boats and water toys is sited along the western portion of the estate grounds. Rich with history, the guard gated Harbor Island enclave is perhaps the most coveted address along the waterfront in Southern California. Poised at the islandâ€™s tip and transcending all others, the space and views afforded by this distinguished residence cannot be replicated.